Your vision sounds great and your shirts look pretty sweet. I just finished up a 2 year stint with Ron Sider’s Evangelicals for Social Action and am willing to bet that they would like to come alongside you folks in some capacity (especially given the fact that much of their membership is greying). I have fowarded your post to them, you might want to check out the meager facebook group we set up in the past year. I think I’m still an admin of it, so I will try to shoot you an invite. Found myself in a similar boat. On the one hand, I have heavy evangelical roots regarding salvation (which anabaptist used to share), modern culture, and much of my faith is very evangelical. However, on Church/State issues I disagree mightily with evangelicals. On peace, I disagree. On social justice the anabaptists had me. So I hover between the two; uncomfortable in both camps. Likewise, I’m neither liberal nor conservative. Here, on YAR, I’m a flaming conservative who is obviously out to oppress the downtrodden. In conservative circles, I’m a liberal wanting to tear down the past. In this I hover between the two; uncomfortable in both camps. I’ll check out EAR, but I suspect my lack of an agenda will place me outside of conventional circles once again. One day I may be accepted. Or perhaps, like our Savior, everyone will continue to despise me. The scum of the Earth. HA! I didn’t grow up Mennonite, evangelical or even a Christian. I fell into evangelicalism as a teen and it was the only Christianity I knew for years. Evangelicalism still informs my reading of Scripture, without taking it over. However, I am uncomfortable with almost all forms of evangelical and Mennonite culture. I love talking theology with them, but I find the cultural overlays uncomfortable, sometimes even suffocating. I think I find myself more comfortable with people who talk about Jesus, but live a less churchified lifestyle. I like hanging with people who smoke, who cuss without blaspheming, and who have lived backgrounds of addiction– although I have experienced none of these. I like being with people who feel free to openly critique their own church, without caring who hears. I don’t have anything against Evangelical or Mennonite cultures– that’s fine, for those who appreciate it. But it’s not for me. I wish the folks who belong to one culture or another would stop making judgement calls based on their culture, instead of God’s will and mercy. Well, I don’t want to be whiney, either. I really appreciate the Evangelicals and Mennonites and Pentecostals I live and work with. I hope we can all work together. i wore the shirt to mennonite world conference and people really liked it. some people didn’t get it, and were puzzled. but overall, it made a great splash. thanks EAR! (please do another run of the shirts) i wore mine so much that it is almost worn out. It seems that a lot of people–often “young” (however that slippery word is defined)–are uncomfortable being fully on board with any denomination. Just one example is http://www.recoveringevangelical.com/. I count myself among the nomads. I have felt–and still feel, to a certain extent–denominationally homeless. Because I’ve found that while I have never felt fully at home in any one tradition, I have been enriched by living in and learning from them. The dialogue between them is varied, complex, conflicted, enlightening, and never boring. I grew up in the Baptist General Conference in Minnesota. Historically and culturally, there are a lot of Swedes, and I fit right in. Theologically, they are evangelical, and tend to be conservative. They taught me to respect the Bible. When I got married, my wife and I became part of a wonderful non-denominational charismatic church. The people were loving, and passionate about living their faith. They taught me that God still speaks and acts in powerful and unexpected ways. My brother and my father-in-law are Catholic. I spent one year at a Catholic college before transferring and was impressed by the nuns who live across campus. They taught me to look for God in beauty both natural and human-made. And now I’m part of TimN’s community, Living Water Community Church in the Rogers Park neighborhood of Chicago. They are teaching me that to love God I must love my neighbor, and to love my neighbor, I must love God. I graduated from a nominally Baptist seminary, have worked at a charismatic Lutheran church, a Baptist church, and a charismatic non-denominational church. On my father’s side, I have generations of history in the Quaker church. I have family who are evangelical, Catholic, charismatic and atheist. Why am I self-disclosing all over this blog? I’ve recently decided that I will never find the “perfect” Christian tribe. No one group of people has all the answers. (And thank God for that; such a group would be insufferable!) Yet I needed to just decide to plant myself in a community, locally and broadly, so that I can have a context from which to join the dialogue. I’ve chosen to be Mennonite, and am pursuing ministry licensing there. Kudos to you who continue the dialogue–especially with those with whom you disagree. What a great way to learn, to grow, and to practice patience and non-violence! I don’t get it. Perhaps I am just naive. Why would “Many Young Anabaptist Radicals might have a difficult time accepting evangelicals among our ranks?” I feel many people who have rejected evangelicalism for a variety of reasons (myself included) would find new hope and encouragement among progressive Anabaptist. However, the way you write this I get the impression that defecting evangelicals might not be well received. Am I off base? Good questions for clarification. You’re only off base in your assumption that I’m talking about “defecting” evangelicals. I’m not. I’m talking about people (like myself) who desire to remain as resolutely evangelical as they are Anabaptist. The assumption that I question in my blog post is that evangelicalism and Anabaptism cannot be successfully merged in certain instances, i.e., that there is something intrinsic to evangelicalism that is inimical to Anabaptism (and vice versa). Does that make sense? I can go there with you. It is good to see an evangelical interest in anabaptism although I think most anabaptist are comfortable with the term evangelical. Growing up I attended a Pentecostal church and later when I was in college I read lots of anabaptist writings. Today I am convinced that the correct way to read the bible is with a Christo-centric lens, I believe that Jesus was born of a virgin, died for our sins, and arise again from the dead and is at the right of God the Father. Great evangelical truths, but also God became man(Jesus) also who came to show us by his person and example how we are to live in this world. Myron Augsburger says it well, “Christ is our norm, our absolute, in a world in which many see everything as relative”. My friends may we fall totally and radically in love with this person Jesus the one that is disclosed in the holy scriptures, and may the 3rd person( the Holy Spirit) of the triune God empower us to become beaming lights of Jesus love in a fallen and broken world. I know this is an old post but I can relate as I was a church denomination hopper for years. Charismatic, evangelical, baptist, megachurch, etc. Quite honestly, sundays would stress me out sometimes. This group believed 1 way, this other group another way and so on. And so much personal interpretation. I just wanted to know the truth. And one sunday, after missing service for a new church I was going to check out, i decidec to go to my local catholic church and never looked back. The mass is said around the world at the same time, same beliefs, same gospels, same everything, as it had been for 2000 years, no confusion, no guess work, just all God. As a catholic Ive grown stronger in my faith. They really did have it right all along. How sad that the reformation splintered Gods church and caused all this mass confusion. 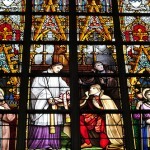 Check out http://www.catholicbridge.com for 100s of the hardest questions on catholic faith. You wont be disappointed. Blessing to u all in your search. With kindness and respect I disagree. The Catholic Church was never at any point the only church and even within Catholicism there have been conflicts. Two examples: the Franciscans weren’t always welcome, and at one point there was more than one vatican type place one in Rome and one in Constantinople. The reformation may have splintered things more but if that is the case so did the corruption in Rome that led to it. Did you know St Peters was built with money from indulgences (the selling of salvation when salvation alone comes from God) or that during the crusades monks were encouraged to kill people with there staff and knights were told they would gain entry to heaven if they joined the crusades. Then there is the Inquisitions…and the not so holy Roman Empire. And let’s just say Constantine corrupted the church making it an institution and starting the first allegedly holy Christian war. I could go on… I’m not saying that Protestants or Radical Reformers were or are perfect but simply am pointing out that Rome is not perfect. Never was never will be. “2000 years, no confusion, no guess work, just all God” I’m afraid not. I would consider myself Anabaptist and Evangelical. I tried the link but couldn’t get to the t-shirts. I would love to see it. I would also love to connect with other EAR’s. How can I do this?